When it comes to the gun safe, the name of the Steelwater stays at the top. They are one of the most popular guns safe manufacturers currently. The Steelwater produce highly secured and liable gun safe according to the customer demands and that’s the reason why they are dominating the market for a long time. Besides, they offer some solid features in a reliable price which is lower than most of the other manufacturers. The Steelwater gun safes are inspected twice to ensure the highest quality standard. You can be always assured about the safety of your guns with the solid gun safes from the Steelwater. Steelwater is providing gun safe related services for more than 22 years. They have a wide variety of gun safe models available in the market. All of them come with strong and unique features so that they can fit your needs perfectly. However, you may feel overwhelmed at the time of choosing the best gun safe that suit you the most. To make the process of choosing easier for you, here are some of the best Steelwater gun safe reviews given in below. A gun in a wrong hand can cause deaths and severe injuries along with other serious problems. That’s why you will require a gun safe if you own guns. If you are going to buy a gun safe and confuse about which one you should go for then the below part of the article can be helpful for you. I will give you an overview of the five most popular Steelwater gun safes. Taking a look at the Steelwater safe reviews will help you to choose the suitable one for you guns easily. Steelwater is always concerned about their customer satisfaction. As a result, they had a wide variety of guns to meet the customers need perfectly. The gun safes come in different shape and sizes so that anyone can buy the gun safes according to their preferred size and shapes. On the other hand, they also produce upgraded versions of the previous models very often for a better security. As there are a lot of variations in Steelwater gun safe you may feel overwhelmed at the time of buying. To help you to choose the best from these variations we have reviewed some of the most popular and best-selling gun safes from the manufacturer. The Steelwater Standard Duty 16 Gun Safe is one of the most popular gun safes from the manufacturer Steelwater. The compact sized gun safe is available at an affordable price though it comes with all the crucial features as like as the other gun safes of the Steelwater. It is constructed with 14 gauge steel and door is constructed with 5” thick solid composite material. The gun safe is secured with a digital lock with non-volatile memory. Besides, there are 10 1.5 inch chrome plated locking bolts in the corners of the door to protect against pry and hinge attacks. The three-way direct drive and bolt system lock can provide you a well-secured safe pace for your guns as an entry-level gun safe. Steelwater Standard Duty 16 Gun Safe has a drill/ballistic resistant hard plate to protect the digital lock from any kind of drill attack. Besides, there is also a re-locking bolt to secure the safe while punched or removed during a burglary attack. The gun safe can protect your safe for 60 minutes at 1875°F from the fire. There is also a feature known as expandable door seal which is designed to seal out smoke and water and expand up to 8 times than its thickness in case of fire. If you are looking for a gun safe to secure around 8 to 10 long guns and ammunition then the Steelwater Standard Duty 16 can be a perfect choice for you. Well-secured as an entry level gun safe. Easy to use and easily customizable. May not store 16 guns as advertised. Plain external hinge and straight handle. Up to 60 minutes fire protection at 1875 Degrees. The Steelwater Standard Duty 16 Long Gun Safe is the heavy duty version of the Standard Duty 16 Gun Safe. The extremely secured gun safe comes with some solid feature which makes it almost unbreakable. It has gun 12 gauge solid steel construction along with a powder coat finish make this gun safe sensational and durable at the same time. The 12 gauge steel body and 12 gauge composite style door provide a heavy resistant against any attack with prying tools. Besides, there is an 8X larger drill resistant hard plate in the door of the safe which makes it almost impossible to drill out. It can resist against fire for 60 minutes up to 1875 degrees. The door of the gun safe is tightly locked with 10 strong 1.5-inch locking bolt to prevent breaking with a power tool. There is also an internal spring loaded re-locking bolt which locks the safe as soon as it is punched out or removed during a robbery attack. The EMP-proof electric lock in the top of the gun safe provides an extra level of security for additional safety. The internal interior of the gun safe feature a unique two-section gun rack which allows you to store the maximum of 8 guns at a time. Besides, there are four adjustable shelves which you may remove for additional space. Steelwater Heavy Duty 16 Long Gun safe can be a great choice for you in lower budget. Gear driven lock and bolt system highest safety. Up to 60-minute protection against fire at 1875 Degree. Beautiful Semi-gloss textured powder coat black finish. Less capacity for the larger guns. Strong 12-gauge solid steel construction. Gear driven lock and bolt system for extra strength. 10 1.5 Inch chrome plated locking bolts. 8X larger drill resistant hard plate to protect the digital lock. Heat activated expandable door seal. Two-section gun rack with 4 removal shelves. The Steelwater 22 Gun Safe can be a perfect choice for those who have a medium range collection of gun and want to secure all of them in a safe. It comes with the group 2 combination locks, a strong and popular locking system preferred by the most of the customers. The gun safe comes with 12 gauge steel construction with a composite constructed 5 1/8” door which includes 3 layers of the fire board. The well-constructed gun safe can resist fire for hours. There are total 18 ½’’ inch compact steel locking bolts which along with the gear driven lock system, provide a solid protection against prying, punching, and drill attacks. There is also an internal re-locking bolt which to secure the safe while punched out or removing during an attack. To make it easier to open for you but hard for others, there are digital keypads on the door which use a unique arrangement of numbers to open the safe. Under the dial pad, there is an 8x larger drill/ballistic resistant hard plate to protect the dial pad, gear drive, and the re-lockers. As like as the Steelwater Standard 12 Gun Safe, the Standard 12 Safe comes with a beautiful fully upholstered grey interior. There are two section carpeted gun racks and every rack hold up to 11 long guns. You can also remove the adjustable removal shelves. Larger capacity for the guns. Well-engineered gun lock with multiple levels of security. Re-locking feature for auto re-locking while punched or removed. Ballistic resistant hard plate to secure the electric lock. Gear driven and bolt driven mechanism to resist pry and drill attack. Weight is too heavy to move. 12 gauge steel construction with a semi-gloss textured black finish. Up to 1-hour fire protection on 1875 Degrees. Three lock options: a combination lock, key lock in the dial and digital keypad. 18 1 ½” diameter solid steel locking bolts. Adjustable carpeted interior to prevent your guns from slipping. The Steelwater Heavy Duty 20 Gun Safe is equipped with multiple strong locking features to provide your guns a better safety. As like as most of the gun safe from the Steelwater, the 20 Long Gun safe is constructed with 12 gauge steel construction along with 5 1/8” thick door which has three layers of fireboard. It can provide protection from the fire up to 60 minutes and maximum 1875 ˚F. It comes with an EMP-proof electronic lock system with highly secured double sided bypass key. You can also upgrade to digital lock if you wish. To prevent drilling and pry attack, there is an 8x drill resistant hard plate along with the gear driven system to secure the lock. The company advertised that you can store 20 guns in the safe though you will be able to store around 12 to 16 guns in the 20 gun safe. The gun safe has a very beautiful semi-glossy textured black finish. There are 10 1 ½” diameter solid steel locking bolts which provide a heavy resistant in the time of breaking with a power tool. Besides, there is also an internal spring driven re-locking bolt which automatically locks when pounced or removed out. Less weight than the other Options. May not suitable for storing 20 guns, as advertised. Up to 60 minutes fire protection in 1875°F. 4 3/4″ thick door with composite construction. 8x’s larger drill and ballistic resistant hard plate. Internal spring loaded re-locking bolts for additional safety. 10 1 1/2” diameter solid steel locking bolts. If you are looking for a highly secured gun safe which can provide an additional level of security than the Steelwater 39 Gun Safe can be a great choice for you. The gun safe can secure your guns for 120 minutes in 1875˚F fires. 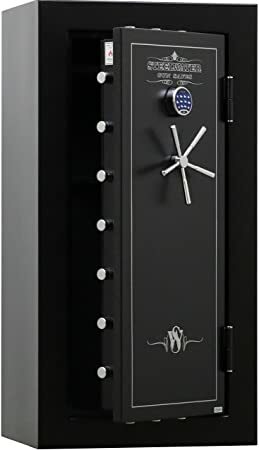 It comes with an 8x hard plate which not only prevents the locks from drilling but also the gear-drive, re-locker, and the other vulnerable areas of the safe. There is also a double sided U-channel reinforced steel top long shelf which prevents any kind of breakage and warping attack. 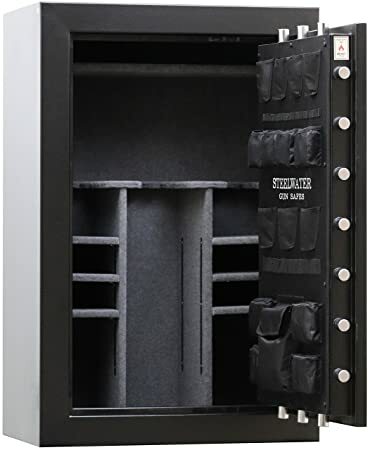 The gun safe is constructed with solid 9 gauge steel along with ¼ inch steel plate on the door and gear driven system to prevent drill, punch and pry attacks. As like as the other Steelwater gun safes, the Steelwater Extreme Duty 39 also features a spring loaded re-locking bolt which secures the safe in case the lock is punched out or removed in the course of a burglary attack. There is a heat activated door seal in the gun safe which is designed to seal out the smoke and water and enlarge up to 8 times its thickness in the occasion of a fire. The gun safe is advertised to hold up to 39 guns in its three section gun racks. Additional time of fire protection, up to 120 minutes. Unique Double Sided U-Channel Steel Reinforced Top Long Shelf. High secure and reliable dial-only combination lock. Extra thick steel construction for maximum strength. Adjustable carpeted interior to prevent inside damages. 9 gauge solid steel construction 1/4 inch solid steel plate door. Two internal re-lockers to secure the safe during punch attacks. 1/4 Inch steel plates in the bottom corners for additional security. Heat activated door seal to keep the smoke and water out. 18 1 1/2“locking bolts to resist pry attacks. Where are Steelwater gun safes made? The Steelwater gun safes are designed in a North Augusta, South Carolina but they are manufactured from a facility in China. Though manufactured from China, they still control the quality solidly and check several times before manufacturing. Besides, they manufacture on a small scale to ensure the quality of the safes. Why Should You Buy a Gun Safe from Steel-water Brand? The designer and owner of the Steelwater gun safe were in the security field for more than 22 years and he have a keen understanding of the security. Here are some features which make the Steelwater gun safes unique. Lock system: The Steelwater gun safe comes with multiple levels of security which includes digital lock, combination lock, gear driven lock and bolt system. Keep the burglars at bay: Steelwater gun safes can provide a heavy resistant against burglars attack with its strong construction and drill resistant plates. Same things go for the Steelwater home safes and other products of them. Fire protection: The gun safe can protect your guns up to 30 minutes to 120 minutes against fire. Store other valuables: You can also store gun ammunition, documents and other elements in the gun safe. Construction of Safe: Constructed with 10 to 14 gauge solid steels. Laws on child access prevention: The Steelwater gun safes can help you to follow child access prevention law perfectly. Security Comes with multiple strong security features multiple levels of security to provide the best possible protection for your guns. The liberty gun safes also have strong locking systems but as not as good as the Steelwater gun safes. Fire Resistance Steelwater provide a heavy resistance against fire for a long period of time. Fire Resistance level is lower in the liberty gun safes. Water Resistance Most of the Steelwater Gun safes are waterproof and provide a heavy resistance during the flood and other calamities. There are very few models of the Liberty gun safes which are waterproof. Construction Steelwater gun safes are well-constructed and the door has an additional drill-resistant plate to prevent drill and pry attack. The Liberty Gun Safes are also well-constructed but the fittings are not compact enough to secure guns. Price The Steelwater Gun Safes are available at an affordable price without compromising the quality. The Liberty Gun Safes likely to cost you more. Where to buy Steelwater gun safe? The Steelwater gun safes are available in both local markets and online shops. You can also buy from their official website. It doesn’t matter from where you buy the gun safes but reading the reviews online about the gun safes will help you to end up with the perfect product that suit you the most. Some of the users find that there is not enough space as advertised in the Steelwater gun safes. However, this should not be treated as a problem as they advertise the maximum numbers of gun that can be stored in the safe. The main reason behind this problem is the customers can’t sort the guns properly and they end up with less space. It can be solved if you properly sort the gun while storing. The Steelwater gun safes are manufactured from China. You may think that the built-quality of the product will not be as good as they are made in China. But this is a completely wrong idea. The Steelwater gun safes are designed in the USA and manufactured from China. The products are carefully constructed and the quality of the product is checked several times before manufacturing. That’s why you will hardly notice any discussion about the negative observation about the Steelwater gun safes construction. The Steelwater gun safes are made with high-quality solid materials. Besides, the locks are well-designed and they are almost impossible to break. The multiple layers of drill-resistance plates in the door of the gun safes provide a great resistance against drill and pry attack during a burglary. Even it is proved with some test. You can trust the Steelwater gun safes without any hesitation. If you own one or multiple gun and budget are not that much higher than you can go for the Steelwater gun safes without any reluctance. They provide a variety of high-quality and solid features to provide you with the exact level of safety for your guns. If you read the above Steelwater gun safe reviews with proper concentration then you will notice that almost all the gun safes have the same features. So you can go for any safes from the above according to your preferred size and budget.